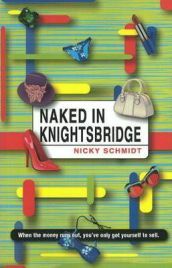 I have to confess I bought Naked in Knightsbridge by Nicky Schmidt because I felt like a bit of light reading, some uncomplicated chick-lit to read over a few days – I’m not a fan of chick-lit in general, I only like certain authors who write at a higher standard than most of the rubbish in the genre, but when it’s done well, chick-lit can make for an enjoyable read – which is what I was hoping for with Naked in Knightsbridge. The main character is Jools, a girl who is down on her luck when her cleaning company goes bust and she is heavily in debt. We follow her through her attempts to earn some money and make a living, and the plot slowly gets more farcical as she decides the only way forward is to sell herself as a bride online. The opening of the novel is promising – things are looking pretty dire for Jools, but surely there will be a sensible solution to her troubles, after all business have problems all the time. But no, she doesn’t do the sensible thing. She gets herself into more debt, she is incapable of getting a normal job, she is incapable of doing laundry and wearing decent clothes, and then very quickly decides that selling herself is the only option left to her. I very quickly grew to dislike Jools. Yes, there is the argument that she is different from the average chick-lit heroine, but this isn’t a good thing in this case. She is lazy, stupid and just not someone I can care about. She continually bemoans her situation but does nothing to help herself. Almost every page seems to have a reference to her ballooning weight, which she loathes – yet continues to eat six cupcakes or donuts in one sitting. I have weight issues, and I know what a temptation cakes and donuts are, but she has absolutely no self control, and not only when it comes to food. When she does have some money she blows it all very quickly – spending £1000 on Crème de la Mer face cream is ridiculous having just been homeless. On top of that, she is quite disgusting – she happily goes out wearing the most awful sounding clothes, unwashed and rooting through skips during a period she is homeless. This is not a character I want to have a happy ending – I don’t care about her, she is not a nice person and she has no will to improve her situation. In terms of the story, it is reasonably predictable, but not so much that you know exactly what is round every corner. Not that it matters when you dislike the main character. The main problem is that once a hint has been made at something, it’s blindingly obvious where that story arc is going to go. The big ending was predictable from the moment the possibility was introduced, as was another side story. The one promising storyline, which wasn’t particularly pleasant but was at least a bit exciting and a bit different, petered out before it reached its conclusion. While the character involved in this, Niles, was even more repellent than Jools, it would have made for a bit of excitement and something different. I was almost disappointed when the big excitement failed to materialise. Naked in Knightsbridge was, quite frankly, a waste of time and money (I do begrudge spending £1.70 on downloading it for Kindle). All I can say to sum it up is don’t bother. No Comments on "Naked in Knightsbridge"